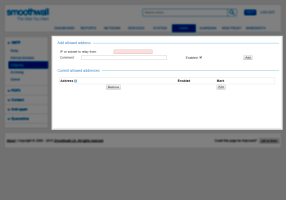 You can control which email traffic is allowed to relay through Anti-Spam based on the originating IP address or subnet. 1. Go to Email > SMTP > Outgoing. • Comment — Enter an optional description of the address. • Enabled — New addresses are enabled by default. Clear the check box to create a disabled address.